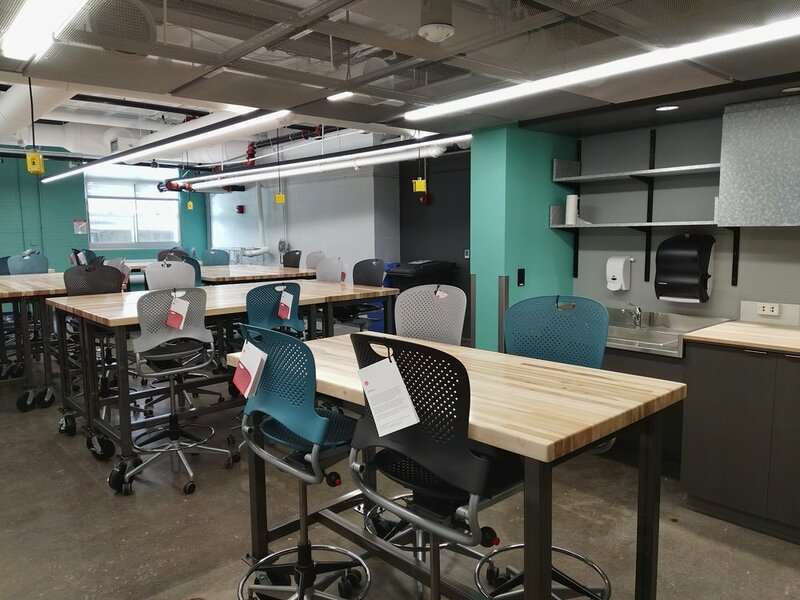 Northeastern recently completed construction on the new College of Engineering Bio-engineering (BIOE) Capstone Studio. The space, formerly used by Student Groups, is reclaimed ground floor area of an existing building with considerable infrastructure to serve the upper floors. This area of the ground floor lacked adequate HVAC, which needed to be added for the BIOE program. In addition to a large open “build” space with mobile tables, a 3D print room and small computer lab are housed in separate rooms served by their own mini-split cooling units. Given the industrial nature of the program, the space was kept flexible and open to allow for easy reconfiguration. Power is distributed throughout the space by overhead cord reels and a welding station is served by a dedicated exhaust snorkel in the fixed counter work area. Linea 5 used an expanded metal mesh ceiling cloud at the entry and over the fixed counter area to maintain the mechanical aesthetic as well as obscure existing overhead ductwork and piping. The existing concrete floor remains, but has been cleaned and sealed. An existing trench that runs through the space is scheduled to have ne metal cover plates installed to provide a caster friendly floor surface. The 3D print room provides a secure location for printers which will handle various types of media and the Computer Lab provides a space for the lab technician and two computer workstations.